On 3 June 2005 the Parliament of Georgia passed Law No. 1549 "On Changes and Amendments in the Law On State Emblem" (text). Various articles of the Law of 1 October 2004 have been modified as well as the attachments to the Law showing the images of the greater and lesser coat of arms. 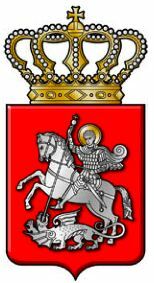 Georgia adopted a new coat of arms by the Law of 1 October 2004 (text). Gules, mounted St. George slaying the dragon, all argent. The shield surmounted by the Royal crown of Georgia (Iberian crown). Supporters, two lions rampant or. Motto: Strength in Unity (Dzala Ertobashia, written in the Mkhedruli script of Georgian alphabet, ძალა ერთობაშია). 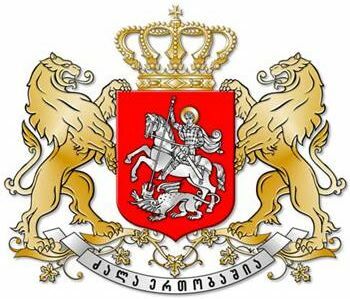 Since no official coat of arms was adopted until October 2004, the President of Georgia used different versions of the arms in different events and places; he indeed used the "last version" of the arms every time. 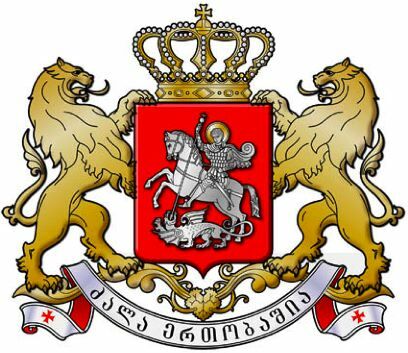 The adoption process for the new national coat of arms of Georgia was officially launched on 16 April 2004. The new leaders of Georgia wanted to celebrate Georgia Independence Day (26 May) with new national symbols. A state commission has exhibited the designs that would compete to become Georgia's national symbol. A jury is to decide on the final design and submit it to the Parliament's approval. It is expected that the decision would be made by May 26 - Georgia's national holiday. Quarterly per cross or; 1 and 4. Gules, mounted St. George with a lance slaying a dragon, all argent (representing all Georgia), 2. Azure, a mount flamed and pierced with two arrows in saltire, all or (representing ancient Iberia; eastern Georgia), 3. Azure, golden fleece on a ribbon of the fourth (representing ancient Colchis, where the Argonauts stole the Golden Fleece; western Georgia); escutcheon: purpure, tunic of Our Lord of the second (representing the holiest relic of Georgia). The shield surmounted by the Royal crown of Georgia (Iberian crown). Motto: Strength in Unity (written in the Mkhedruli script of Georgian alphabet). Several members of the Parliament found that coat of arms was too "pagan", because of the Golden Fleece and Prometeus' Caucasus mountain, two elements from Greek mythology. The early proposals of the coat of arms were without a motto. Motto was discussed by the ad hoc commission as a separate topic. The commission eventually decided to adopt the motto "Strength in Unity" and Gongadze added the motto to his proposal.